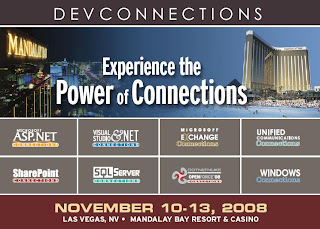 Last week I was in Las Vegas attending to the DevConnections 08 conference at the Mandalay Bay Hotel. I must say that I was expecting more cutting edge presentations and crowd, but instead people where more from the enterprise business solutions industry. However I got to see some really interesting presentations, specially John Papa's Data Access with Silverlight 2 presentation and also Scott Guthrie's keynote where he mentioned six successful Silverlight 2 projects and two of them were made by Schematic, so that was really cool. The Gu is a really nice person and I got to meet him and talk to him about the future enhancements of the Blend/VS workflow and VS2010. I remained manly on the VisualStudio&Architects and the ASP.NET tracks, although there where tracks for SQL, SharePoint, Exchange and Windows. In my case, the VS and ASP tracks where the more compelling to me. There were a lot of remarks about the new ASP.NET MVC framework and how to integrate it with other ASP.NET components and technologies and also with WFC and Silverlight 2. There was also a few presentations talking and demonstrating how to build RESTful services with WCF and Silverlight 2, so there's a lot of interesting things coming and it seems that integration of the Microsoft technologies is a big deal this days. Anyway, this post is just introductory, I'm going to do a couple of posts with the summaries of the two days I was at the conference.